Context sensitive help is help set up to open at a topic relevant to the field or screen that the user is viewing. This article provides an overview of the way context sensitivity works in WebHelp and FlashHelp generated by RoboHelp. This article shows you how you can create URLs to call your help context sensitive. This allows you to create your own context sensitive help calls and allows you to create your own API. I focus on developers and others who want to know what options are available to them. I assume you have some experience with RoboHelp and WebHelp as I will be using default RoboHelp terminology. If you are looking for a quick tutorial to get working with context sensitive WebHelp or the default RoboHelp APIs, see Calling WebHelp on Peter Grainge’s site and the article Providing Context-Sensitive Help for Web Applications by John Daigle. I tested the methods provided on this page with RoboHelp 7 and later. This description may work for earlier versions, but I haven’t tested that. FlashHelp works exactly the same as WebHelp. In all the subarticles, I will omit ‘FlashHelp’ and use only the term ‘WebHelp’. This article focus is solely on WebHelp. Calling WebHelp Pro using the RoboHelp Server is different from ‘regular’ WebHelp. First navigate to another URL such as http://www.google.com and then try the URL again. Amend the call to avoid conflict. See the table at the start of http://www.grainge.org/pages/authoring/calling_webhelp/using_urls.htm for more information. To help with developing your own API’s, here are a few custom API’s that you can use out of the box. In order to work with context sensitive help, you or the author of the help system can create ids for the topics in your project you want to call. (You can also omit ids and use URLs.) In RoboHelp you set these ids using the Project Set-up pod. In the Project Set-up pod, go to Context-Sensitive Help > Map Files. 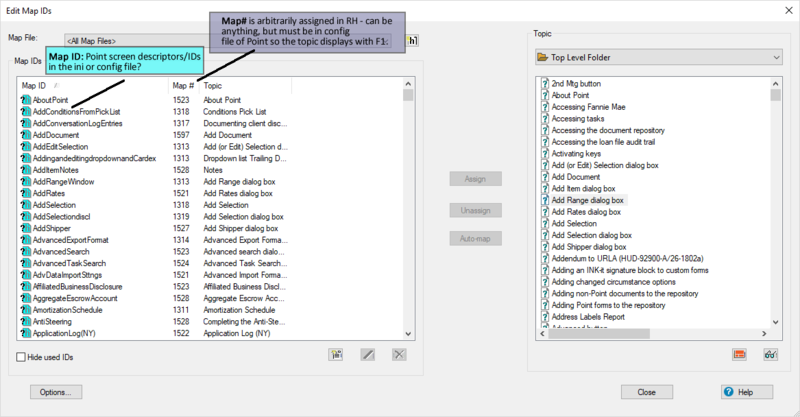 You create the context sensitivity by opening a map file. When using ids, you assign a unique topic id and a unique Map number to a topic or an anchor in a topic. The Map number is a unique number ranging from 1 to 4,294,967. The Map number is the id used for context sensitive help in CHM files and can also be used for WebHelp. The topic id (called Map ID in the RoboHelp interface) is a unique alphanumeric string that identifies the topic. The topic id has a maximum of 255 characters and you can use letters, numbers and underscores. A topic id can also consist solely of numbers. The topic id is used by RoboHelp to connect a topic in the project to a map number. It is possible that a developer provides a map file that the author has to import in RoboHelp. The map numbers still need to be mapped to the correct topics. When the author has created context sensitive help in RoboHelp, the developer can use the project map files (files with the .h or .hh extension) and the alias file (.ali file) to import the context sensitivity in the application. RoboHelp provides several APIs to help you call the WebHelp. These APIs are pieces of example code to help developers build contextual help calls into the application. When you call WebHelp, you normally call the start file of the output. To make the call context sensitive, you provide one or more parameters in the URL to allow the WebHelp to display the correct topic. The APIs provided with RoboHelp are shortcuts to building these URLs. In this article I list the methods and options you can use for calling WebHelp. This allows you to create your own URLs to call the WebHelp and will allows you to create your own APIs. If you use merged projects, you can simply use the methods described in these articles. If the project cannot find the topic id or map number in the master project, the WebHelp will cycle through all the child projects until it finds the correct topic. You do not need to merge map files in the master project or anything like that. Dynamic User Centric Content (DUCC) allows you to define different sets of help for different types of readers. If you use DUCC, you need to know which start file you want to call. Apart from the output folder you need to choose, calling WebHelp context sensitive is the same for regular WebHelp and WebHelp with DUCC. Calling the start file of the project. This will automatically open the default content category. Calling the desired content category directly. The rest of the call is the same as for regular WebHelp. The regular project start file, such as newproject.htm. The _csh start file, such as newproject_csh.htm. The _rhc start file, such as newproject_rhc.htm. Every start file expects an URL with specific options. The regular start file is all that you need and supports context sensitive help by using topic id’s, map numbers and URLs. The other start files are legacy start files that may still be useful. Every start file offers multiple ways of calling the WebHelp contextually. There are a total of five methods you can use to show the help topic you want. Note that there is no one start file that supports all the available methods. By using the Map number you have set in the RoboHelp project. By using the topic id’s you have set in the RoboHelp project. By specifying the relative path to the topic from the project root. In the remainder of this article I will describe every start file, its options and the methods it supports. I will first describe the regular start file as that is probably all you need. Relative path to a file in the project. Relative path to a file in the project folder but not in the project. Specifying the window you want to use. Specify whether you want the help to open in a separate popup. The regular start file is very flexible since you can use windows (RoboHelp > Project Set-up > Windows) to determine how your help will look: showing or hiding the navigation pane, showing or hiding the toolbar and setting the browser dimensions. I assume you are familiar with windows. One note: Always deselect Use Default Browser Settings in the window definition or the window will not work in Firefox. If you do not want to use a window definition at all but just open the help, consider using the _csh start file. Say that we have a fictitious context sensitive WebHelp project published on http://localhost/newproject.htm. The file newproject.htm is the start file of the project. In this section I will show you how to create a URL to call this WebHelp project. id Map number Call using a map number. If you specify both a map number and a topic id, the help shows the topic corresponding with what is listed first in the URL. str Topic id Call using a topic id. The topic id is case sensitive. If you specify both a map number and a topic id, the help shows the topic corresponding with what is listed first in the URL. url Path to file A file in the project directory. This will show the file without the skin. The file may be a topic from the project or another file. The path must be relative from the project root. topicurl Path to file A file in the project directory. This will show the file and the skin. The file may be a topic from the project or another file. The path must be relative from the project root. wnd Window name The name of the window you want to use. The window name is case sensitive. You need to create the window in the RoboHelp project. cmd Pane code The pane to open: toc for TOC, idx for index, fts for search, glo for glossary and none for the navigation pane hidden (but the toolbar is visible). newwnd Boolean Set to false to open the help in the same window (do not create a popup). Set to true to create a popup. A popup is created by default. RoboHelp 8 and higher only. java Boolean Set to false to open the help in the same window (do not create a popup). Set to true to create a popup. A popup is created by default. RoboHelp 7 (and possibly below) only. If you use the option cmd, you cannot use context sensitivity. The project will always open the default topic even if you specify an id and a window. You can only specify a window if you use id, str, url or topicurl. You may define the options in any order you want. The Firefox default popup blocker blocks the help popup for WebHelp. If you support Firefox, consider setting newwnd=false. Open whcsh_home.htm in a text editor or HTML editor. Find the second instance of if(gsWindow)on line 210 (RoboHelp 8). Save changes and close whcsh_home.htm. You can now use a window defintion and open the help in the browser window instead of opening in a popup. The difference between # and #>> is that the first method expects a relative path to a topic. If you do not want to specify a topic, you must add #>> after the URL. If you only add a hash, the WebHelp will think that the first option you specify is a relative path to a topic. This means that the >> directly after the #is optional when you specify a relative path. Note: If you do not specify a relative path, the project opens the default topic. cap string Set the title of the help project. cmd number Sets the default pane that is shown: 0 for no pane, 1 for the TOC, 2 for the index, 3 for the search and 4 for the glossary. pan number Determine whether the navigation pane and the toolbar are shown: 1 to show only the topic (navigation pane and toolbar hidden) or a 2 to show the toolbar and navigation pane. The script only checks for a 1 or any other number. The scripts in the WebHelp itself use 2.
pbd string Sets the default pane that is shown. This parameter only works when use the regular method. Use cmd instead of this function. The available settings are: toc for the TOC, ndx for the index, nls for the search and gls for the glossary. pbs string Available panes set by the window definition. This parameter has no effect on the WebHelp. pot number Holds the window option. The only option I could find: If set to 1, it disables browse sequences in the minibar. Note: When you want to call the relative path, you must specify the relative path before you specify any options. Otherwise the help will not open the correct topic. This legacy method is useful if you do not want to use window definitions and simply want to open the help in the browser. Note: I’ve seen queries on forums wondering where the _csh start file is in RoboHelp 9. It’s still there, but there is a catch if you are using Dynamic User Centric Content (DUCC). If you are using DUCC, RoboHelp generates multiple instances of the help, one for each content category. The main folder only contains a start file that loads the default content category. The _csh file is not available in the main folder, but is available in every subfolder holding a content category. empty, add value after hash Map number Call using a map number. topicnumber Map number Call using a map number. empty, add value after hash Topic id (must be alphanumeric or it will be seen as a map number) Call using a topic id. topicid Topic id Call using a topic id. remoteurl Path to file A file in the project directory. This can be a topic from the project or another file. The path must be relative from the project root. ,newwnd Boolean Show or hide the navigation pane. Note: The Firefox default popup blocker blocks the popup for local WebHelp. I added this legacy method for the sake of completion. I recommend using one of the other methods because they both provide context sensitivity using topic ids. context Map number Call using a map number. HelpIdFromHTMLHelp_ Map number Call using a map number. If you use this option, add the map number directly after the string. Do not add an equals (=) sign. topicnumber Internal id Call using an internal WebHelp id. empty, add value after hash Internal id Call using an internal WebHelp id. withnavpane Boolean Show or hide the navigation pane. Note: The internal id is assigned only in the WebHelp output. This id is not available in the RoboHelp project. Posted in In-depth, RoboHelp and tagged Context Sensitive Help, CSH, RoboHelp. UPDATE: I have uploaded the new Help CHM file into the software. I see the new topics, keywords are in place. The previous topics still link to the correct pages, however, the new topics do not open on the proper screen. That’s the last part I need. They seem to think it happens automatically (the previous person was a unicorn genius). What do I need to do to make the new topics pop up on the new screens? If I need to purchase support, I can do that as well. Thanks! Your developers are calling the help either through the file name of a topic or through an ID. GIven the images, it’s probably done through the #. CHM’s normally go by number. Is there a file or table in the database that links topics to a #?